When we saw this trailer months ago, it was pretty exciting. James Bond and Indiana Jones in the same movie and they play cowboys. Then you add on a layer of WTF, just to make sure that the geek in all of us is salivating for this. The concept is fun, just saying the title. You would have to do serious damage to screw this up. I am pleased to say that no serious damage is done. This is the movie that you expect it to be, it relies a lot on the appeal of the stars but more than anything, it is the concept that makes this payoff. Cowboys on horseback, shooting guns at aliens in spacecraft. Yep, it is as simple as that. One of the reasons I like doing the blog is that I have been burned by professional reviews and critiques on a number of occasions. If a storyline or actor or concept is appealing, I think I should give it a chance. Sure I may end up seeing something that pisses me off, but at least I am pissed off because I made my own judgement. If I stay away from a theater, because some one else”s opinion scared me away, I am putting a lot of trust in that other persons opinion. Once upon a time there were critics that mattered and I would listen to. I have found though that I am much more satisfied being driven to a film by criticism than being driven away from one. Positive comments have brought me to movies like last year’s “City Island”. The negative commentary on a film may be accurate but if it contradicts my natural instincts, should I trust it? There were a number of weak notices for the current film. One clever writer subtitled their Review, “Cowboys shoots itself in the foot.” I sure don’t want to be disappointed but I also don’t want someone else telling me to ignore my core instincts. When they are right, I have only myself to blame for spending money on trash, but if they are wrong and I listened to them, then I blame myself, and them for missing out on something that would have been a pleasure. I can find things to like in most films, when something irritates me I’m glad to share. I don’t think people should read my opinions and deny themselves a movie they would enjoy, but I do want others to know how I feel and I am happy to have them share with me. Reviews in mainstream papers and other media outlets could discourage you from seeing Cowboys and Aliens, if they do, you are missing something you probably would have liked. One of the professional reviews I read said that this movie adds nothing to the western genre and it uses a lot of western cliches to simplify the storytelling. Except for a movie like last years remake of “True Grit”, there are nearly zero westerns released most years. I can think of a half dozen over the last five to ten years. So who is going to be overly familiar with those western cliches except old guys like me that used to see westerns in theaters and still watch them on video? My daughters best friend watched “Silvarado” at the house a few weeks ago, she is twenty three, it was the first western she had ever seen. 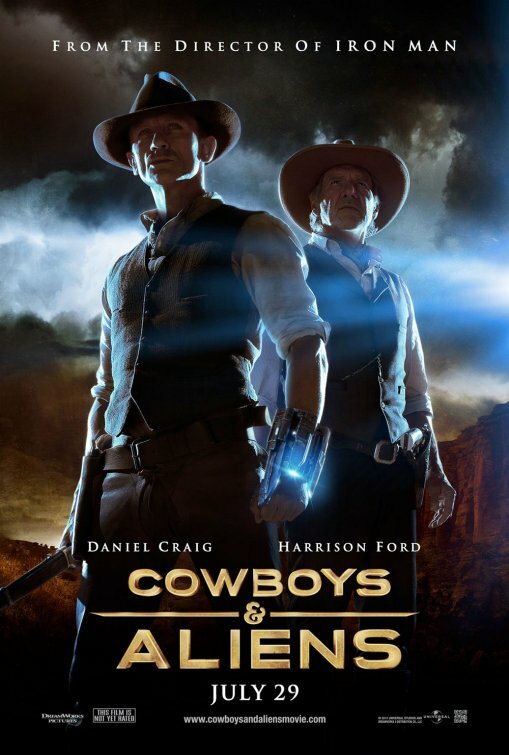 “Cowboys and Aliens” is made for casual viewers of the western genre, not John Wayne enthusiasts or obsessive viewers of Sergio Leone. You get a solid set up of the western conventions, and then a huge twist is thrown in to make it different and fun. The term “mash-up” is being used to describe this film, but I think a mash up is more about genres that make no sense together. This movie is told as if it were a straight action film, and the events could have actually taken place in the old west. Now if Daniel Craig and Harrison Ford started dancing and singing, that would be a mash up. Here, they are conventional western archetypes, put into a different kind of conflict. Very little of this is science fiction. The aliens could simply be a different Indian tribe the cowboys are encountering. There is a central mystery, several character lines and an action story being told in the running time of the movie. Harrison Ford is so grizzled, he could be playing the Gabby Hayes role in the movie. Daniel Craig is more stoic than Clint Eastwood. My guess is he has fewer lines than just about any Eastwood western ever. Some good character actors get to play in a western movie. Keith Carradine belongs in a movie like this, it would be nice if there was a little more for him to do because he is so good. Walter Goggins is an actor we have found in the TV series “Justified”, which is basically a modern western. He is doing the Strother Martin prairie scum part very effectively and has some of the funniest moments in the film. Sam Rockwell is just good in everything he does, his part does payoff here but it would be nice if there were more to it. The alien stuff is fun, but they do not dwell on scientific explanations, or drool over the technology that has been invented for the movie. Yes the aliens are the antagonists but we do not really need to know much more about them than they are nasty and see humans as little more than insects. This is a shoot em up, with some fun images, a wacky idea and some terrific actors. everybody has fun for a couple of hours and then we go home. My oldest daughter said when the movie was over, “That’s exactly what I wanted from this movie.” I must concur. If you are interested in the premise and the combination of the actors, you will get what you are looking for. If you want groundbreaking genre transforming cinema, then I guess you might be disappointed. I would only have been disappointed if I had let weak word of mouth keep me out of the theater. It’s pretty much exactly what you think it’s going to be, and that’s why you are there in the first place, right?